ICAN allows for working alongside renowned experts at the frontier of today's medicine. It is my conviction that ICAN's detailed letter of recommendation about me, written by ICAN's CEO Marcia Horn and ICAN's Director of Research Services Regina Marie Klopfer, enabled my admission into my first-choice graduate program. IUPUI (Indiana University-Purdue University Indianapolis) offers translational bioinformatics and other cutting-edge research areas in close association with the Indiana University School of Medicine, and I look forward to contributing what I learned under ICAN as a Health Disparities Research Intern. Once again, it was so helpful to talk to someone that understands and could help us navigate our choices. Especially when the choices could have life or death consequences. I will keep you updated and once again, thank you. Thank you for your phone calls, for your guidance, for your information...When I was facing a dark, scary forest, you lighted a path for me and inspired me to be courageous throughout this tough new journey. of "cancer care." Had we not found this organization, we definitely feel our family member would have been abandoned and left for dead. shortsighted doctors and staff that find themselves in a quagmire caused by corporate hospital statistics that seem to be more important than the humans themselves. ICAN is an amazing organization and I recommend contacting them at the first entrance to any cancer labyrinth of "care," no matter what the stage. I was diagnosed with prostate cancer early in 2013. Between that moment and my robotic prostatectomy in July of that year, I utilized the resources of ICAN. I feel strongly that each one of us needs to be our own best advocate. I really enjoyed the prompt and complete response to my inquiries to Marcia at ICAN. Understanding the current thinking and best practices along with the predictive outcomes of the various therapies really contributed to my personal therapy decision. My surgeon actually commented that I was one of the most informed patients that he had ever treated. I feel that ICAN was and is a part of my advocacy team. Thanks ICAN!! Almost 12 years ago, through ICAN, I was put in touch with Dr. Pettit. 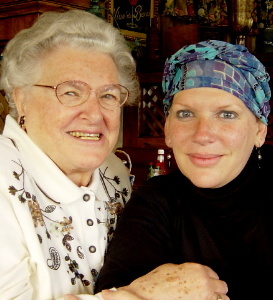 At that time my daughter was found to have Ovarian Cancer. Through his and Marcia's guidance and constant consultations, I was able to give valuable input to her cancer treatment by the fantastic physicians treating my daughter. Ovarian Cancer patients rarely survive more than 3 years. Five years is considered lucky. Twelve years is a miracle! As of today - 11 years, 11 months, and 10 days - my daughter, Wendy, lives a full life and is disease free as determined by all recent testing. Wendy being alive and disease free is only because of the skills of her treating physicians and the dedication of the people associated with ICAN - such as Marcia Horn and Dr. Pettit. Personalized medical treatment is the epitome of medical treatment for cancer patients. My family is fortunate to have had that opportunity. Thank you for what you do for so many that have critical needs. You were and are a blessing to me! Thank you, thank you! You are definitely my earth angel! I recently had a need to call ICAN regarding a family friend that had been recently diagnosed with pancreatic cancer. My friend was without health insurance and his family was overwhelmed with questions about his care. I made the call to ICAN on their behalf and was so grateful for the time and direction that I was able to receive. Within minutes I was referred to someone who was able to set up a second opinion for my friend. Although the outcome may not change, it has made all the difference to my friend and his family that someone listened and cared. I will forever be grateful to ICAN for their help. 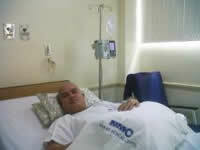 If it weren't for ICAN, I would have been put on exactly the wrong chemotherapy. My oncologist admitted he was going to put me on one drug and then changed his mind when the molecular profiling report results came back. And that's because ICAN had armed my oncology team with the knowledge that ordering gene expression profiling and other studies was the right thing to do. He would not have ordered the report on his own—he practically admitted that, and I was frankly relieved that he reacted so positively to ICAN's suggestion that such a report would be of tremendous use. And that is because ICAN is my cancer patient advocate and had briefed me on this topic and how to approach it with my oncologist. My last set of scans showed that my cancer did not grow based on the drug that the molecular profiling report thought might be of clinical benefit to me. I don't know what I would have done without ICAN. ICAN has empowered me to ask the best questions of my oncology team and to make sure no stone goes unturned in my journey with cancer. I am still taking chemo, and my scans show that I am cancer-free, which is great news since this all started when I was diagnosed as a metastatic cancer case. I know Marcia at ICAN, International Cancer Advocacy Network, to be tenacious in advocating for cancer patients. She connects each individual with "the" oncologist/specialist best suited for the specific patient's needs. I have seen her open doors faster than you can blink; and they are the right doors. Marcia's network in the oncology community is - as far as I can see - unparalleled. My husband read about ICAN in the December 2011 Newsweek article and encouraged me to contact them. We had just emerged from several months of intense treatment for metastatic Stage IV breast cancer (my original diagnosis and treatment was in 2006), including emergency spine surgery, and almost eight weeks of radiation treatment. When a PET scan revealed there was no improvement but actually progression in my disease on hormone therapy, we were both stunned, scared and very disappointed. After a few days of processing this bad news, I pulled up the ICAN website and sent off an email immediately. Within a few days I was speaking to Marcia Horn, President and CEO of ICAN. Our conversation took almost an hour of Marcia's time, while I feverishly scribbled down notes. Before speaking to Marcia that morning, I was feeling terribly anxious and pessimistic. Marcia urged me to join the percentage of breast cancer patients who have survived their odds, suggesting names of exciting new treatments and specialists who would consult with me. Marcia urged me to consider taking a closer, more comprehensive look at my individual pathology and gave me information to follow up with Caris Life Sciences, a state of the art lab in Dallas doing some very exciting work. We are still waiting to determine if chemotherapy is next in line for me, but at Marcia's insistence we are now in the position to determine what might be the most effective step for me. And one that might save my life. I am only 48 years old and have two young daughters and a loving husband and family to live for. The next time I saw my doctor I came with a stack of notes and questions, and now the data of the Caris lab results. I am so grateful for Marcia and her team of volunteers at ICAN for giving me a sense of empowerment at this most critical time of my life. "...I've had extensive experience working with a variety of oncologists, scientists in various disciplines, and advocates assisting the victims of cancer....One of the most dedicated, productive, resourceful, creative, and overall brilliant advocates for cancer victims that I've ever had the pleasure of knowing and assisting is (ICAN's CEO) Marcia K. Horn. She leads...with great expertise and productivity." Dr. Pettit is one of the world's most prolific discoverers of anticancer drugs for human cancer treatment. Hi I'm Jay C. 38 years old from Cavite, Philippines and I'm one of the lucky cancer (testicular cancer) patient who has readily been assisted by Ms. Marcia Horn. She is a jewel for us who has cancer. She helps us in all the steps to undertake to make us prepared for the challenges ahead. She also makes good advise and serves as my second opinion that guides me well in my cancer treatment. I couldn't thank you more and we are lucky to have and know you. Keep up the good work and God bless you always. More power! I wanted to take this opportunity to thank you for everything you have done for us over the past 2 years. You have been a constant support system and sounding board. I truly appreciate all of your advice. God bless. 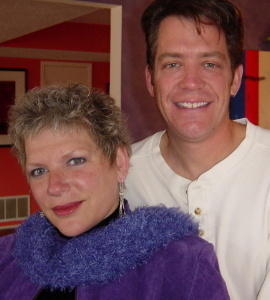 When my husband was diagnosed with non-small cell lung cancer,my life went into shock and hyperdrive at the same time. I was bent on getting him the best information out there to reassure us both that we had access to the best team and the best medicines and best techniques available. I always referred to this disease as "we have cancer." I put all my friends to task as well, and one very special friend directed me to ICAN. It was the culmination of the search for credible and accessible information, including the doctors and the medicines that we needed. Thank you beyond all thank you's, ICAN, for your perseverance in supporting all of us suffering from this disease and the phenomenal work you are doing. This org has helped me get in contact with the clinical trial people, called on my behalf when they were dragging their feet, helped me find the oncologists who know melanoma best. These folks are like my family and help me through the bad times and good. ICAN fights for the lives of late-stage cancer patients by helping to manage the complexities of their disease with cutting-edge information services, physician referrals (at the patient's request), and the most relevant resources to be found anywhere. We want to thank everyone at ICAN so much for all your support and your timely intervention regarding my dad's cancer. You were a Godsend at a very scary time in his, and our, lives. Male breast cancer is very rare, and without your help and guidance we wouldn't have had a clue where to turn. I am happy to say that my dad did NOT die of cancer, rather a bad heart valve. Thanks again! Following my husband's treatment in a clinical proton beam radiation and chemotherapy in preparation for a complete Whipple Surgery, we had many questions. We followed the advice of someone who knows ICAN very well and contacted the organization for help. Since then, we have received a great deal of useful information from the ICAN Staff. By keeping in touch with us and intuitively providing us with the information we need to know, ICAN is truly the best "coach" imaginable. The knowledge gained from working with ICAN has definitely enhanced our game plan. As a result, we have been able to express our questions to our oncology team in a compelling manner. Cheers to ICAN – here’s to life, to hope, and to vitality! While the doctors in Poland were giving us no hope or any encouragement and simply "wrote off" the patient, the International Cancer Advocacy Network (ICAN) responded in a very efficient, professional manner providing wonderful referrals and suggestions. Thank you so much for being extremely responsive. You amaze me with your attitude dealing with people with complex and depressing issues. I am grateful that my sister forwarded your info on to me. What you offer is something that no family member or friend can – clarity and practical, actionable info from experience and contacts. Thank you again. You have given me back my perspective and helped me clear my head so I am not in panic mode any longer. A long overdue thank you for your advocacy, caring, research, intervention, expertise, and for doing all that you do. You saved Jackie from unnecessary procedures and educated all of us in the process. We know that this is what you do every day regardless of your other commitments. Please put this "thank you" towards helping ICAN continue to do what you do so well. We are blessed to have you in our "family" and once again, thank you from the bottom of our hearts. On behalf of all of us… Thank You!... for all of your support and guidance, we don’t know what we would have done without you. What you are doing and have done is simply remarkable. I cannot thank you enough. ICAN: You are the voice of calm, reason, and stability coupled with tremendous intellect and knowledge when the rest of the world seems to be spinning out of control. I really want to say thank you. You have helped me tremendously not only seek out help, but guided me in possible solutions to this terrible illness. I honestly never expected to meet someone so willing to help, someone who would hold my hand throughout the whole thing, and really inspire me. But from the first time I met you, I knew that you were different. So many people offer small gestures of help, but not you; you were so insightful about possible treatment options (especially the TPN and Dr. R) when I had no clue what to do next. It really showed me someone with passion, emotion, and a heart which are qualities not commonly found in the world of oncology. Again, thank you! I am alive today due, in large part, to IFADD. As a 45-year-old battling metastatic breast cancer, I have had three chemotherapies, four radiation protocols, and I am on my third [round of] hormone therapy. In the spring of 2002, IFADD’s CEO, Marcia Horn, asked Jay Alderson, my father-in-law, how I was doing since I had been diagnosed two years earlier with breast cancer. He reported that I was experiencing lower back and leg pain.Marcia told Jay that "when one has been previously diagnosed with breast cancer, there’s no such thing as unrelated back or leg pain unless a bone scan has been taken and shows that the breast cancer has not spread to the bone." Based on IFADD’s urgent recommendation, I told my oncologist – who had not ordered a bone scan – to order one immediately. The scan showed a golf ball-sized tumor in the lumbar area of my spine. It was so large and obstructive that it had gone way past the point of being operable. So, the breast cancer had, in fact, spread to the bone, and IFADD had suspected that fact before my own medical team had. Immediately after I wrote to IFADD with the results of the bone scan, I received four very detailed, informative, and compassionate e-mails from IFADD. Empowered by this accessible and relevant information, I met with my medical team to discuss my treatment options and my prognosis. I've been in contact with IFADD ever since, on every aspect of my treatment plan, plus I've consulted IFADD at each fork in the road that calls for a decision on what to do next in the battle for my life. Because of IFADD and its Breast Cancer Patient Advocacy Programs, I was no longer willing to accept back and leg exercises and useless prescriptions for muscle relaxants (prescribed by my former medical team) as a substitute for diagnostic imaging to see if my cancer had spread. Because of IFADD’s wonderful lifeline of Program Services – that your generous support tonight will continue to make possible – I took responsibility for my health care by seeking a second opinion at M.D. Anderson, and turning to Arizona Oncology Associates in Phoenix for my subsequent care. Because of IFADD, I have an ongoing lifeline of information support plus the moral support of this incredible organization, and I now have a real passion to talk to other late-stage cancer patients … to emphasize the importance of patient empowerment and clinical trials. Because of IFADD, I am better equipped to encourage our national legislators to do all they can to expedite the anticancer drug pipeline through enhanced funding of the National Institutes of Health. 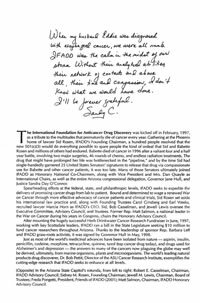 Although Sylvia lost her battle with cancer in June 2005, she remained confident and insistent that she had been blessed ... IFADD had saved her life, not once, but twice. In the last stages of her illness, Sylvia said that the end would have come much sooner, had it not been for IFADD. The above remarks were written and presented by Sylvia Vizcaya-Alderson at the IFADD Jewels of the Sea Ball 2004 at the Westin Kierland Resort in Scottsdale, Arizona. Click on the image above to see this article from "Angels of Arizona" - a tribute to nonprofit organizations, benefactors and volunteers.